Day two of my Sugar Bowl 2013 exhibition with a lil fragment of a photo I decided to play around with in my editor. Granted, my photo editing skills are something less than desireable.. but I figured why not give it a shot. Feel free to critique me all too hell… I probably deserve it. 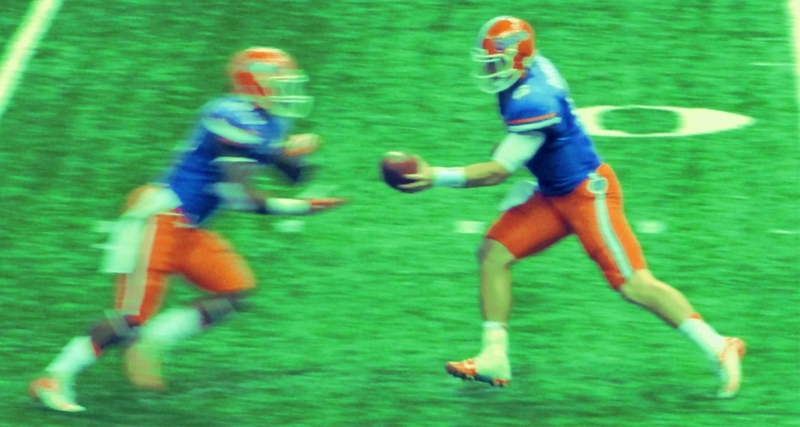 This photo shows Quarterback Jeff Driskel about to hand the ball off to Runningback Mike Gillislee. This is actually a fragment of the actual photo and as you can see obviously has a good amount of motion blur. So I decided to sort of use that to the images advantage and my attempt was to make it appear sort of like a painting. I promise this is the only photo in this particular exhibition I took this sort of liberty with.